The action at the Tournament of Elements heats up as Cole battles Sleven above the molten lava pit. Attack with Cole’s staff and dodge Sleven’s thrusts with his huge stone blade. Defeat Sleven and dash across the bridge before it collapses to claim the Jade Blade! Includes 2 minifigures with assorted weapons and accessories: Cole and Sleven. 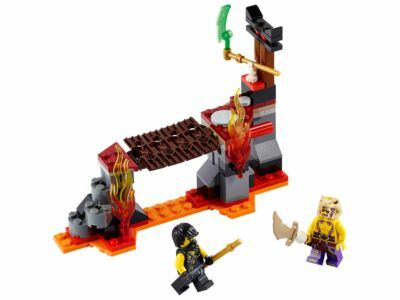 The Lava Falls (70753) Lego set is no longer directly available from the sites below. However, 3rd party partners of these sites might still have the set available. Alternate description Team up with Cole against Sleven in LEGO® NINJAGO™ Lava Falls with lava pit, collapsing bridge and Jade Blade plus 2 minifigure weapons.